Bakula loves shopping in her village – Hebri (near Udupi); a habit she has had since her childhood days. Last year she came across a beautiful, handwoven sari being sold just for a meagre ₹100, which shocked and upset her tremendously. Following the trail found on the label that attributed it to a weavers society in Udupi, she found out that in three years time, these saris would cease to exist, as all the current weavers were all over 65 years of age, and sadly, the younger generation wasn’t involved in the trade. 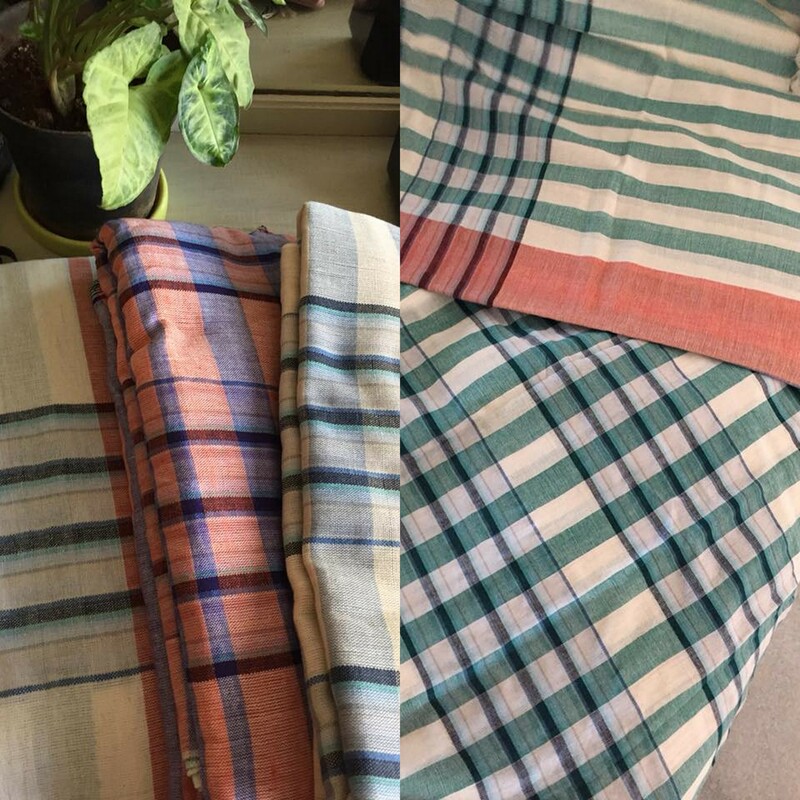 In a moment of despair, Bakula asked for help on social media and received a tremendous response, that led to the birth of the Spandana and Spoorthi initiatives by Savitha Suri; countless women came together (a lot of them from Kai thari – a handloom group on Facebook, started by Sumita Pai) to get the saris woven, to give money upfront towards a sari, without even seeing the end-product, thus helping and encouraging the weavers. Bakula also travelled to Mangalore to do a recording with the radio station, Akashvani where she spoke in Konkani (the native language of Mangalore) on how she uses her art (as she happens to be an avid painter too…read our post on her paintings, right here) to try and preserve our culture, heritage and literature. When Bakula met an eighty-five year old weaver, with loads of unused yarns and no work, she bought them without having any thoughts on how she could use them or provide help to the weavers. But then, help came from the Universe and Savitha Suri offered to do the logistics for selling and procuring from Ashok, who runs a shop, Maanini for Udipi saris. Thankfully, these Udipi saris started selling like hot cakes and this project thus learned to stand on its own two legs. “From 10 looms then to 40 today. From 135 saris then to almost 3000 today. Earnings and production capabilities have doubled. The hands at the looms have trebled. Spandana became the mindful touch it was meant to be. Spoorthi is work in progress and is a silent textile revolution, whose impact will be felt sometime this year. Both these projects were zero profit initiatives and followed Fair Trade principles with nearly 75-80% of the price going back to the weavers. The remainder was used for packing, shipping and incidental expenses. Isn’t this what we all talk about on various platforms? But, how many designers who use artisans actually follow this practice, is questionable! 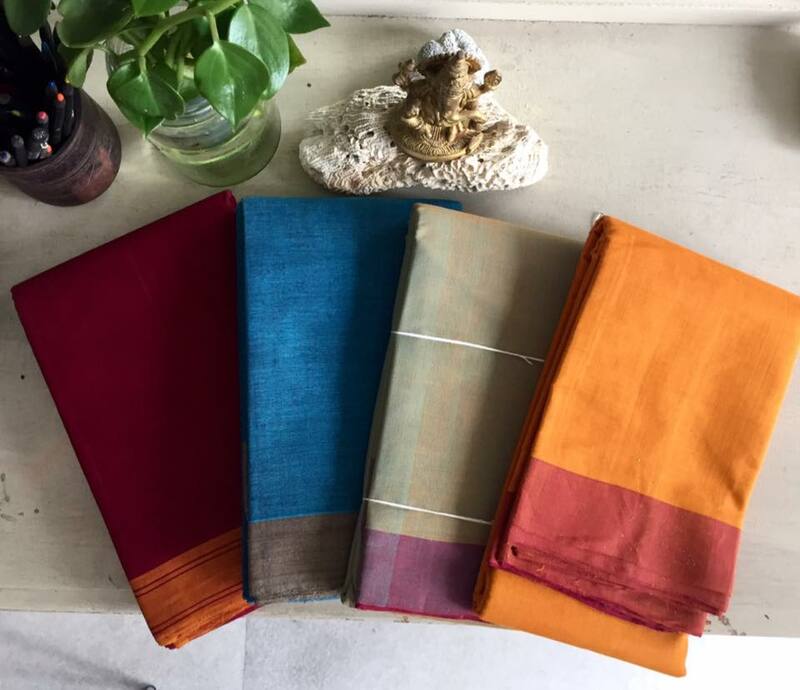 Overwhelmed by the success of the Udipi sari and the fact that it was loved by women from across India, encouraged Bakula to take this further. This was a project to give the Udipi and Kunbi saris their due recognition, appreciation and respect to the weavers and their craft. 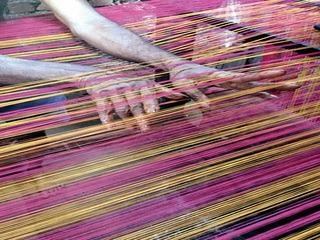 Not just this, but also to reignite pride and passion for the handlooms in the very villages they were made but were not popular in use. Bakula hails from Udipi with ancestry in Goa, hence geographically it was relatively simpler to plan the logistics of travel to take the stories of the end users back to the villages they came from. So, she marched on..,not scared to ask for help, and she did get help, and a lot of it. What will be achieved by the pictures of folks draped in Udipi and Kunbi? Bakula was lucky enough to take part in a 2-day workshop conducted by Mr. Madhav Sahasrabudhe, a mechanical engineer from Pune , who is passionate about spinning. 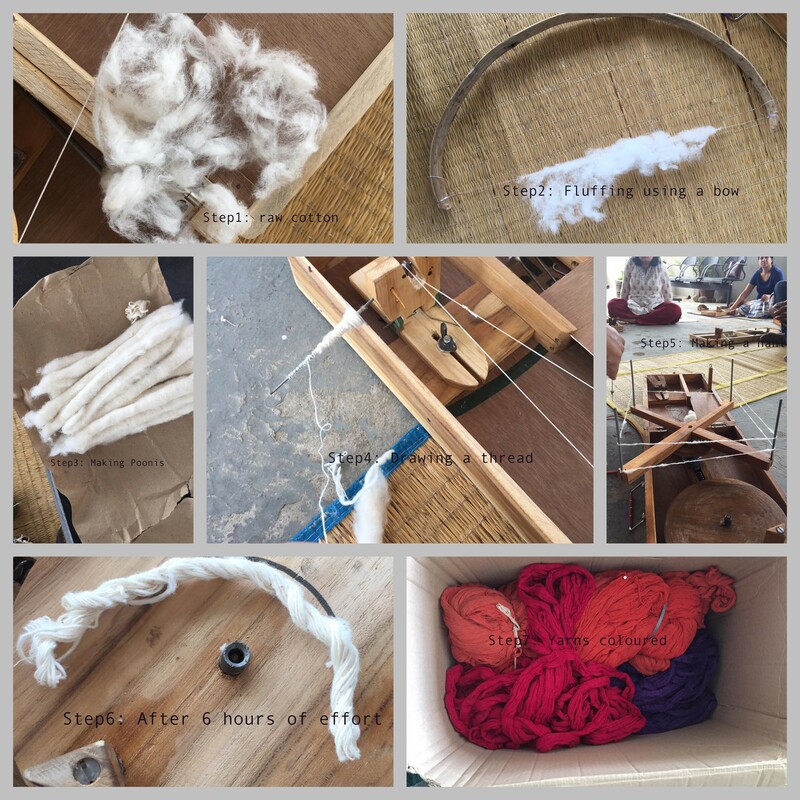 Watch and learn the process of taking raw cotton and turning it into yarn. The next time when your brain tries to set you into ‘bargaining mode’ with the weaver, just pause for a second and think about the effort and time that goes into creating this. Appreciate the hand-weaving process, be Notjustashopper! Please note: A service call will then be made to you within 48 hours of filling the form and you will be guided through the purchase and payment process. Please note: Those who wish to buy a Kunbi sari through this initiative may email us at . We will reach out to you once we resume taking orders. (Estimated time to fulfill orders is between 6-9 months). Support the weavers, wear the hand-woven handlooms, and remember hand-woven does not always have to cost the earth! Be a part of this project, spread awareness and be draped in gorgeous handlooms every single day….Be Notjustashopper!